Class of 2020: Sam Rayborn, Reis Vernon, James Williams, Hunter Renner, Connor Hunt, Jack Olsen, Matthew Shipley, Mason Shipley, Brock Travelstead, Justin Cash, Ben D’Aquilla, Edward Dellinger, Stefaan Forbes, Adam Heston, Owen Lawson, Quinn Maretzki, Zeke Mata, Tabor Miller, Benjamin Banks-Alterkruse. Class of 2019: Jackson Foster, Colton Theaker, Daton Montiel, Brian Buschini, Connor Sullivan, Cayden Camper, Austin Dennis, Landon Fogelman, Everett Hayes, Harry Hill, Nathan Batten, Micah Hertz, Nick Kokich, Asa Kempton, Dean Janikowski.Junior College / Transfer: Triston Brown-Merrill, Jaime Medina, Vincent Blanchard, Bradley Santos, Taiten Winkel, Tanner Carcamo. 2018 AZ Fall Camp Recap – Dunker and Montes De Oca Impress! The road to Vegas XXXIII continued in Phoenix, AZ on Sunday December 9th. The Southwest region continues to show increased talent with every visit. Take a look at the results. 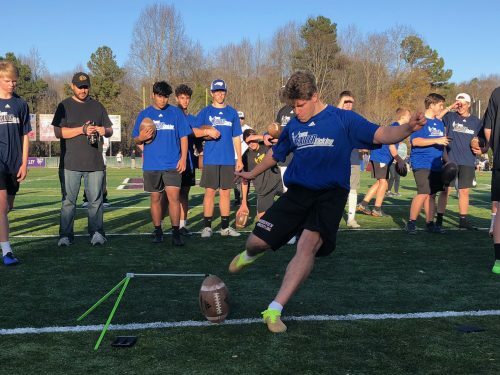 Lucas Dunker (2020, CO) – Being his first Chris Sailer Kicking event, Lucas really showed that he has the leg strength to compete with the top kickers in his class. 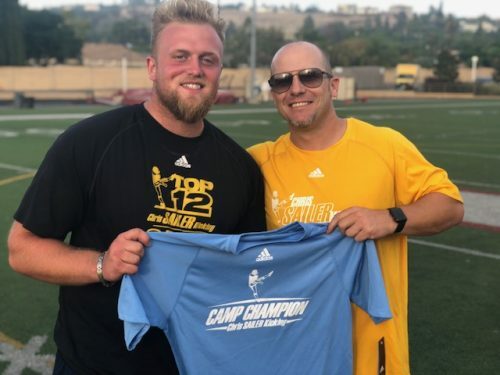 On this day he won the field goal charting, the punt competition with multiple punts over 40 yards with 4.2+ hang times and became the overall 2018 Arizona camp champ. Lucas showed that he has range from 55+ from field goals and that he can put his kickoffs in the end zone on a consistent basis. Look for Lucas to compete for a top spot at Vegas XXXIII. 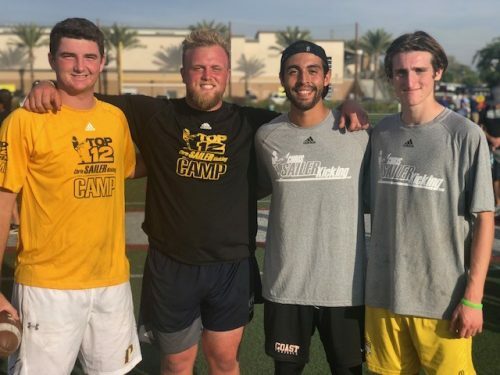 Max Montes De Oca (2020, AZ) – Max beat out Lucas Dunker for the Last Man Standing field goal competition with 51 and 53 yard field goals into a slight breeze. Max is new to kicking this year but has shown that he has the leg strength and talent to develop into one of the best kickers in his class. With multiple kickoffs going deep into the end zone and plenty of punts at the 4.3+ second range, Max has the talent to make Top 12 in the near future. 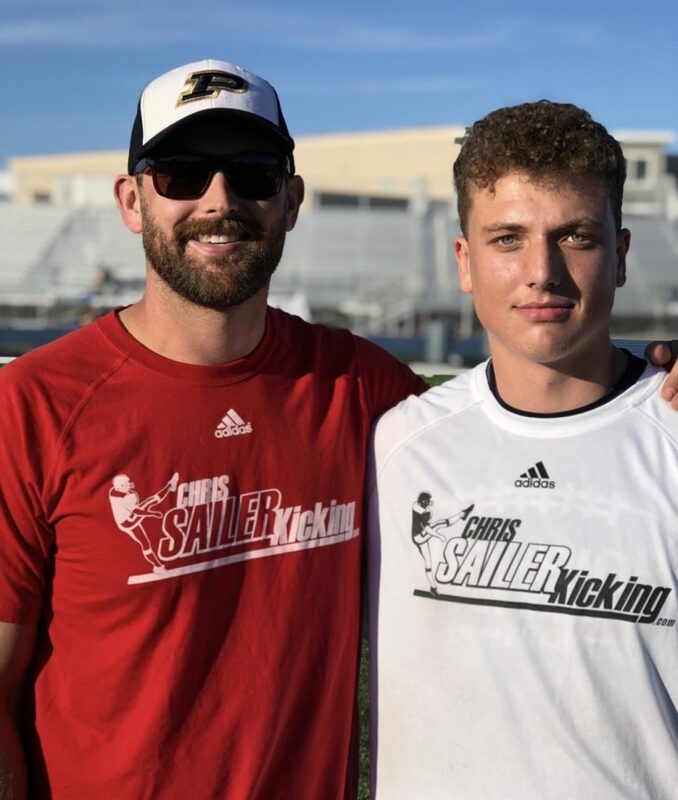 Carson Zilmer (2020, AZ) – Another new Chris Sailer Kicking student, Carson immediately showed off his leg strength. 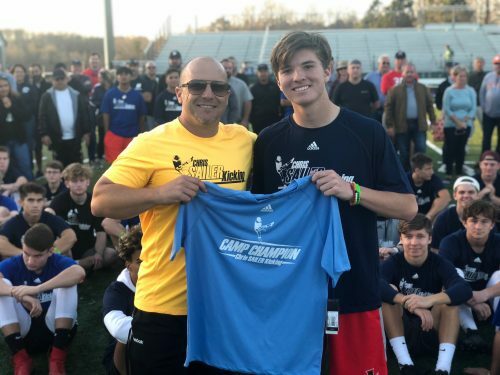 During the afternoon competitions, Carson not only showed that he could put his kickoffs into the end zone with 3.6+ second hang times, but showed he can could compete in field goals as well by being a finalist or semifinalist in every competition during the day. Carson is has the body type and athleticism to become one of the top performers in his class. I’m a Senior, What Should I Do In November? 1. Stop panicking. We are still very early in the recruiting process. Less that 5% of the class of 2019 (K/P) have made college commitments. 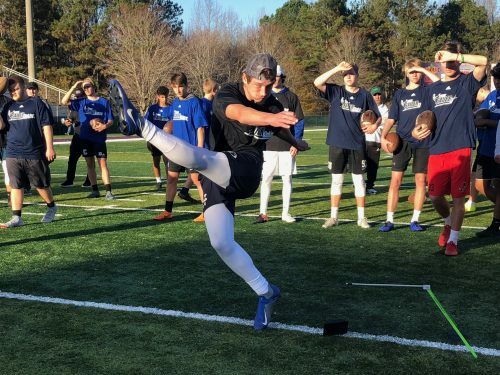 Less than 10% of the class of 2019 (K/P) have been offered any sort of college opportunity. Note, there are many waves of recruiting. Recruiting will last all the way through August when fall camps officially begin for the upcoming college football season. 2. Take unofficial visits as often as possible. An unofficial visit simply means that you have to pay for the visit yourself. Getting on campus is the best way to show a college football program genuine interest. Sending emails, making phone calls, direct messaging on social media, etc. simply isn’t enough anymore. A coach will know that you have a real interest once you make the effort to get on campus. 3. Start to narrow down your search to universities and colleges that are realistic options. This includes level of football (FBS, FCS, D2, D3, NAII, JC, etc. ), level of academics, region of the country, etc. Stop targeting D1 football programs if you are not a D1 recruit. Stop targeting high academic institutions if you have a 2.0 GPA. Find schools that will reciprocate interest in you and opportunities will follow. 4. Ask for an opportunity, not a scholarship. Every college coach in America knows that you would like to be offered a scholarship. When you ask for a scholarship, this turns them off. You are basically limiting communication opportunity. When you ask for an opportunity to be on the team, coaches will be receptive. You are opening a door for communication. The goal in recruiting is to create options. Offers of any kind, create buzz, which create more options. Scholarship vs. Preferred Walk On offers will take care of itself in the end. 5. Get ready for XXXIII (January 19-20, 2019). The biggest mistake made these days is thinking that recruiting for seniors is already over by this time. In fact, it is the exact opposite. 90% of Kickers / Punters in this class will be recruited heavily during this time of year. It will be feeding frenzy. National Letter of Intent Day (NLI) is in early February. Vegas takes place this time of year for this reason. College coaches pay a tremendous amount of attention to the Vegas results and post Vegas rankings. Scholarships offers and preferred walk on opportunities will be won this weekend in Vegas. THIS IS WHAT VEGAS LOOKS LIKE! SEE YOU THERE…. Vegas XXXIII (January 19-20) Early Registration Deadline & THE 2019 ALL-ACCESS PASS! This coming Monday November 19th is the Vegas XXXIII (January 19-20, 2019) Early Registration Deadline. Be sure to register by midnight to get the early registration discount price of $450. The price will increase to the regular price of $500 on Tuesday November 20th. 2. 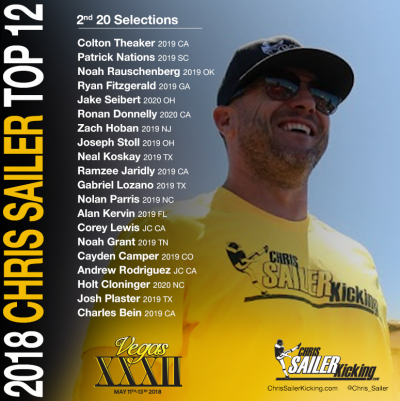 Chris Sailer Kicking will select/invite 20 Kickers/Punters from Vegas XXXIII to attend the prestigious TOP 12 Camp (July 15-17, Los Angeles, CA). This is your first chance to get invited to the TOP 12 Camp. If you are not selected this time, you will have a second opportunity to be selected/invited at Vegas XXXIV (May 11-12, 2019). In total 40 Kickers/Punters will be invited to the TOP 12 Camp from both Vegas Events. Here is a look at the 40 talented athletes that were invited in 2018. 3. Vegas XXXIII is HUGE for seniors, Junior College Prospects and College K/P’s looking to transfer. Trust me on this one. Read THIS BLOG on what you should be doing in November! I HIGHLY recommend the 2019 All-Access Pass to any kicker/punter that wants to play college football and has the dedication that is required to make it to the next level. 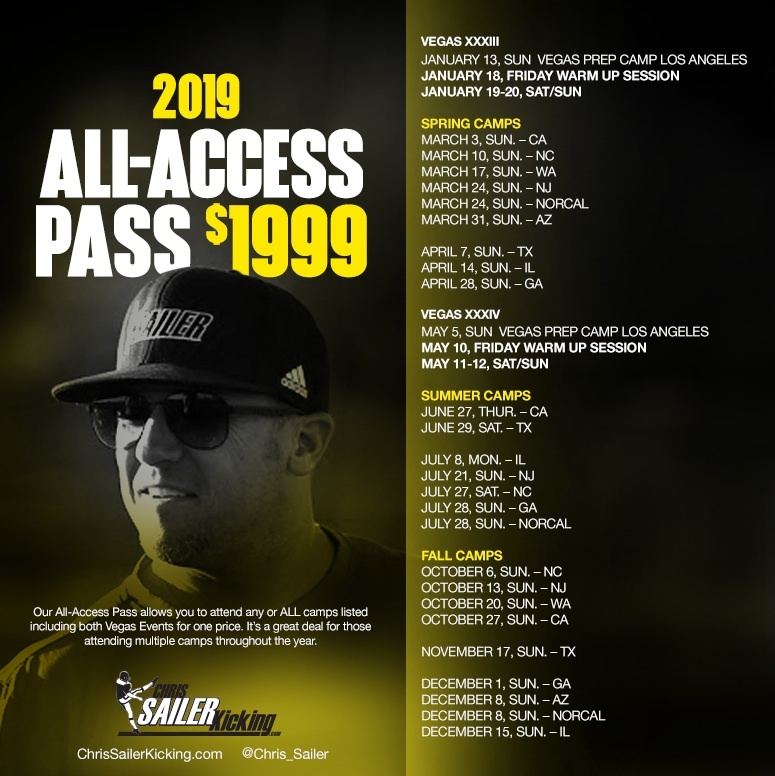 To see all the details of the ALL-ACCESS PASS and to see exactly which Chris Sailer Kicking Staff Members will be coaching at each camp, CLICK HERE. You can plan your entire 2019 schedule right now. 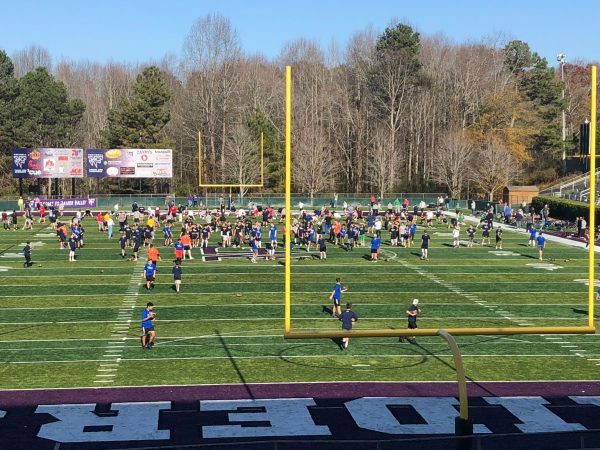 Purchase the ALL-ACCESS PASS by December 31st to ensure that you can take advantage of all 2019 Camps. I have already been told by several parents of veteran Chris Sailer Kicking Families that this will be a tremendous Christmas Gift! 2018 CA Fall Camp Recap – Corey Lewis Comes Up Big! Corey was phenomenal all day long. He is a top 5 national junior college combo prospect without a doubt. He has big time leg strength and competes with great confidence. On this day he won the kickoff competition by averaging 70+ yards, with 3.9 – 4.15 hang time. His field goals were equally impressive. Corey is also a strong punter. He is ready for the D1 level without a doubt. Offer Now!!! Cavan was fantastic from start to finish. He won the field competition by going 8-9 with a long of 58 yards. 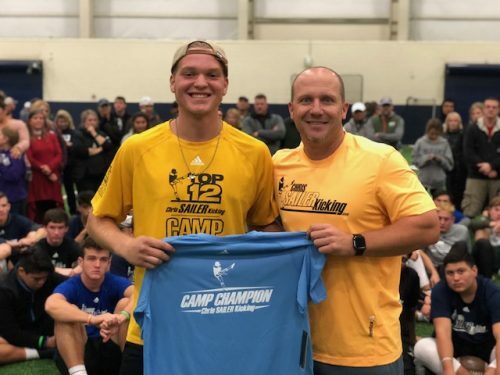 He hit over 90% of his field goals on the day and showed fantastic range off the ground. His kickoffs were also strong. 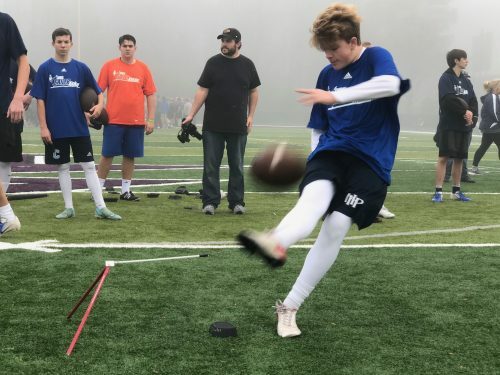 The first time Chris Sailer Kicking camper proved very quickly that he is a D1 prospect. He has the tools to compete anywhere and will be a fine addition to a college program. The Stanford commit, TOP 12 Member, 2019 All-American Bowl Selection, Vegas Champion & TOP 12 Camp Champion added another victory to his resume. Ryan averaged 45+ yards with 4.5 second hang time on punt. He also dominated on both field goal and kickoff. Ryan is one of the most consistent all around performers we have every had. He has a bright future with Stanford. Chris had an outstanding day. He is a great looking athlete with an explosive leg. He was victorious on punt by averaging 45+ yards with 4.3+ hang time. His best balls top 50 yards with 4.6+ hang time. He is a very consistent junior college punter that has all the tools to take his game to the next level. 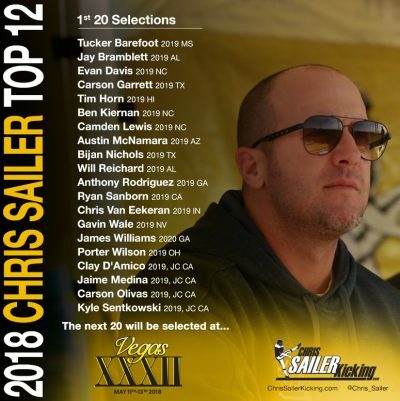 Look for Chris to compete with the best of the best at Vegas XXXIII and turn the heads of college coaches. 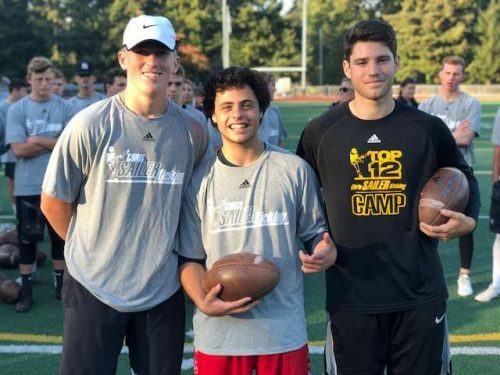 2018 WA Fall Camp Recap – Kyle Sentkowski Dominates! 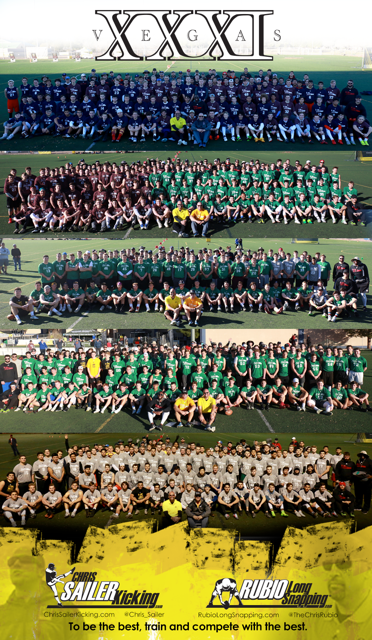 Chris Sailer Kicking traveled to Seattle, WA for the largest camp to date in the Northwest. 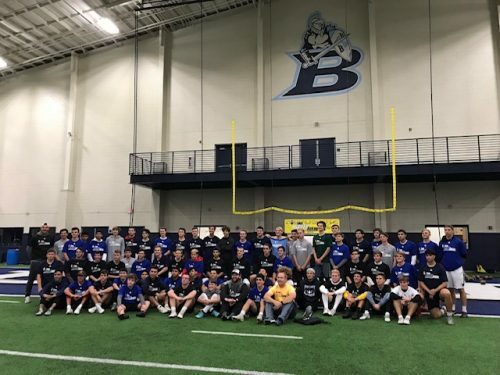 Nearly 60 Kickers & Punters participated in this very popular growing camp. The weather was ideal once the competitions began and the results were impressive. Take a look at the results. 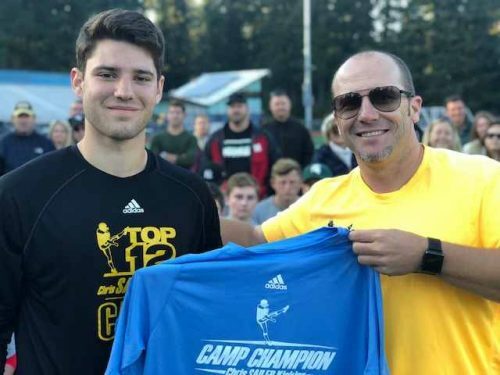 The long time Chris Sailer Kicking and 3-Time TOP 12 Camp Invitee was absolutely dominant. He won the kickoff competition on this day by averaging 70+ yards with 3.8-4.10 hang time. Kyle was also fantastic on field goal. He made 85% of his kicks and once again showed range of up to 60 yards. Kyle has proven on a consistent basis that he is ready for the next level. He is going to be a great player for a college football program. 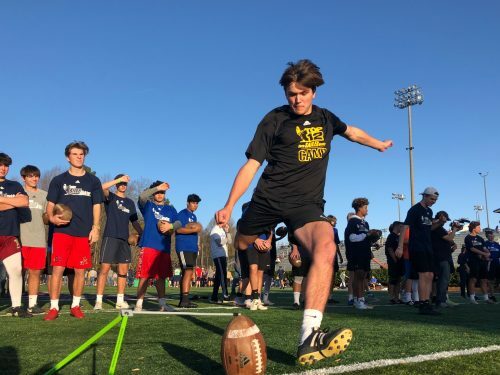 Micah put on his best performance by far at Chris Sailer Kicking camp. He has developed into a fantastic college kicking and punting prospect. On this day he won the field goal competition by going 8-8 and hitting from as deep 55 yards out. His kickoffs are solid. Micah also does a nice job punting the football. Micah has the tools to challenge at both positions at the next level. Nick is another long time Chris Sailer Kicking K/P that is really starting to come into his own. He was clearly one of the most talented punters in attendance. He averaged 40+ yards with 4.4+ hang time. His best ball measured 50 yards with 4.8 hang time. Nick is also a talented kicker. I project him as a P/KO specialist at the next level. He is a fine young man that has a bright future ahead of him. 2018 NJ Fall Camp Recap- Aidan Clark Pulls Out a Close One! 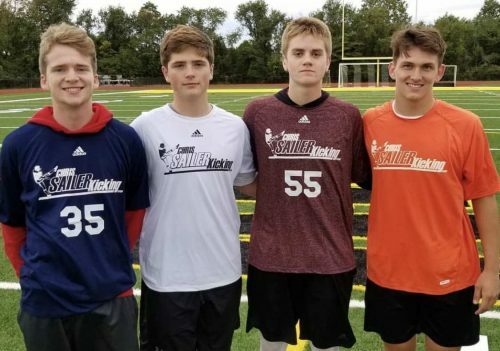 The 2018 Chris Sailer Kicking Fall Camp Tour and the Road to Vegas XXXIII continued this past weekend in Holmdel, NJ. 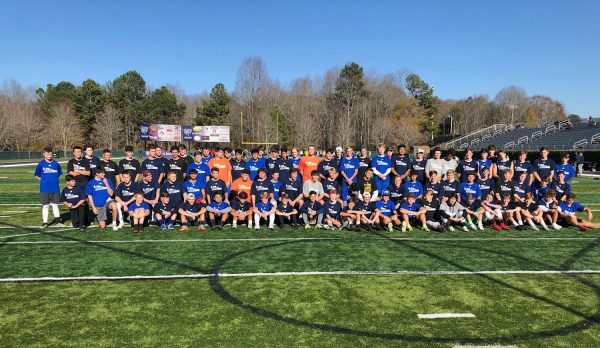 Over 50 specialists representing 6 states attended this growing camp. The conditions were ideal and the results were great! Take a look..
Aidan had his best performance at a CSK to date. 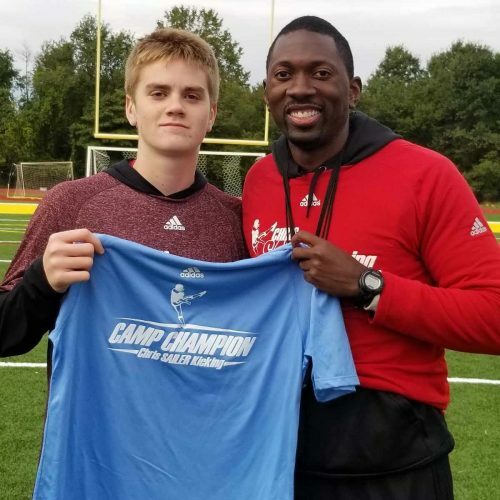 He won by showing consistency in the afternoon session making the finals in both the field goal charting competition and kick off competition. He then came out on top in the last man standing competition. He won the camp by showing great range from 50 plus. On kickoffs, Aidan has the ability to drive the ball deep into the end zone. He will be someone to watch for at Vegas XXXIII. 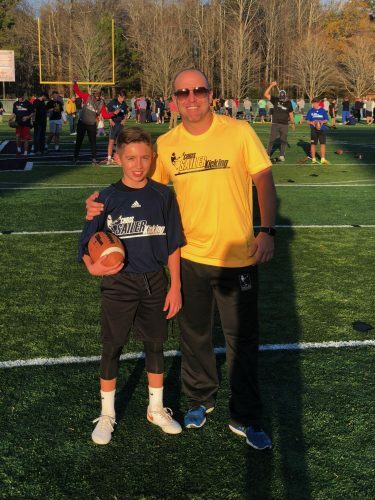 Than was far and away the most talented kickoff specialist at the camp. He averaged 55+ yards per kick with 3.7-4.0 hang time. He also made strides in his ability to kick fields goals showing a smooth transition to kicking off the ground. Than is very composed and will make a fine addition to college program. Look for him to compete for the kickoff title at Vegas XXXIII. Tommy was the most improved veteran Chis Sailer Kicking student at the camp. He has made tremendous strides in his consistency and leg strength. 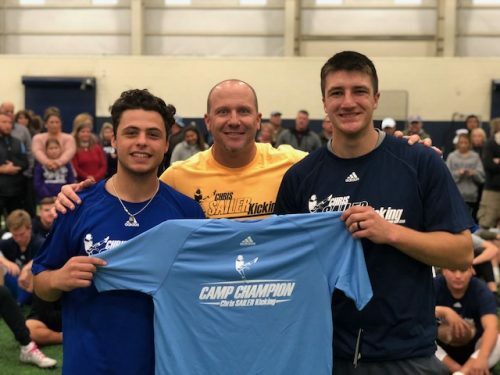 He won a major field goal competition by going 5-5 with an impressive kick from 50 yards that had plenty of room to spare. He only missed a few kicks the entire day. Tommy also displayed punting ability by hitting several punts 40+ yards with 4.2 plus hang time. Tommy has a very bright future ahead as a combo athlete. Look for him to have a strong showing in Vegas XXXIII. Adam was a step ahead everyone punting the ball. The ball exploded off his foot as he hit multiple punts 45+ yards with 4.6+ hang. Adam won the punt competition with a punt of 42 yards and 4.35 hang time. Adam also showed the ability to kick field goals. Look for him to dominate the punt competitions at Vegas XXXIII.